Remember when I said I wasn't really a snacker? Remember?? I am addicted to both...it's becoming a problem. oh man. i am addicted to ice cream and it is def a problem. 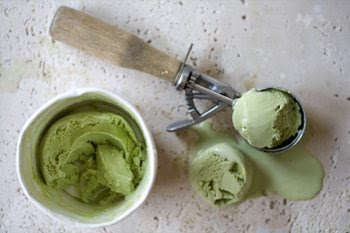 its not your fault green tea is high in Caffeine so its the ice-creams fault! driftwood shack...i like that i'm totally going to blame the ice cream! done. sarah...i'm glad i'm not alone. I a-d-o-r-e those pistachio crisps!! Oh man. Both look really yummy. Now I'm craving ice cream...thanks to that photo! I've tried the ice cream and love it but have never tried the crackers - pistachio sounds wonderful. Thanks for stopping by my blog - love yours!! mmm. now i have a problem because neither one of those are in my house. I am absolutely addicted to green tea ice cream!!!!! Im so glad I have a green tea friend!!!! Its awful but I crave it ALL the time. I had to fast it for awhile cause I started noticing back fat:) Oh GT Ice Cream, how I love you!! oh no! Green tea ice cream....I am in serious trouble! print a day -- first off, love your prints! second...yes, i've considered mochi, but i'm hesitating to open the door to more temptation. That combo would throw off any type of resolutions! oh that looks amazing! what kind is it and where did you get it? I just picked up a bag of the Peanut Crunchers yesterday from Target and can't stop eating them! Loving this True North brand! that is by far one of the best tasting ice cream...but you REALLY have to be careful with pistachio...lots of calories! I saw those pistacio crackers in the store and bought them out of curiosity. OH MY GOSH!!! I could have them for dinner!!! so i'm thinking the protein in those crackers somehow negate the calories...no? ...at least that's how i'm justifying them.